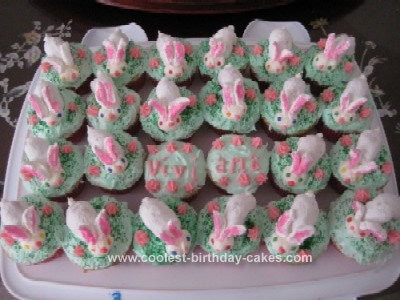 I’m surprised I haven’t seen postings of bunny Easter cupcakes this easy, yet. For the grass, I dropped a few drops of green food coloring in whipped store-bought frosting. I added some green sugar sprinkles for effect. To make the bunnies, I used half a powdered mini-donut for each body. I used my own white frosting (1 cup powdered sugar, 2T shortening, 2T butter, and milk until I got a soft but thick texture, about 2tsp) and piped it on to make the heads and cottontails. The ears are made from large marshmallows, which I squished so that the round flat part became oval. Using kitchen shears, I cut a cross section of that oval, then cut it again lengthwise. Since these pieces were sticky, I could press one side of them into pink sprinkles, and the ears stuck easily in place on the body. For the noses, I used strawberry Nerds candy and for the eyes, I used round color sprinkles. I think it took about an hour or so to decorate 24 cupcakes. For Easter I decided to make cupcakes instead of lots of candy for my table. 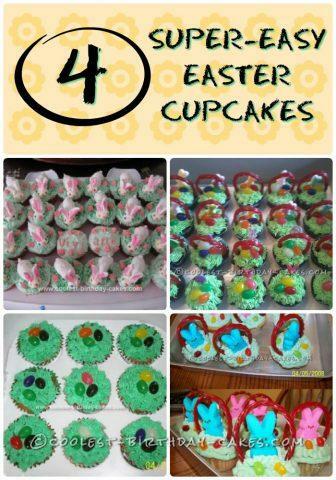 These were super easy Easter basket cupcakes and the kids can help too. I just made vanilla cupcakes. I tinted vanilla frosting with green coloring. I used a tip to make it look like a basket weave to do the grass part of the basket. 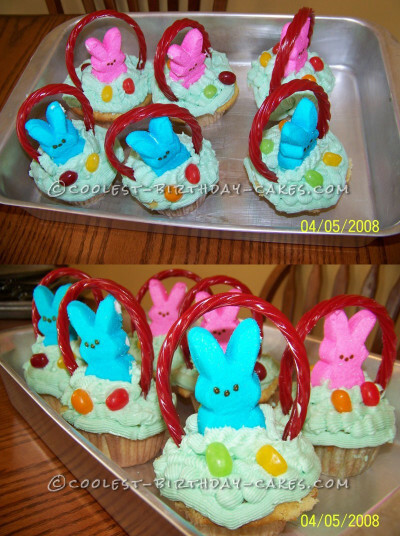 Then, I just added bunny peeps, jelly bean eggs, and licorice for the handle. The kids and adults loved them. The kids can put the jelly beans on and love that they get to help. I made chocolate cupcakes and a homemade butter cream icing. I then colored the icing green and used my cake tip that makes the icing look like grass. 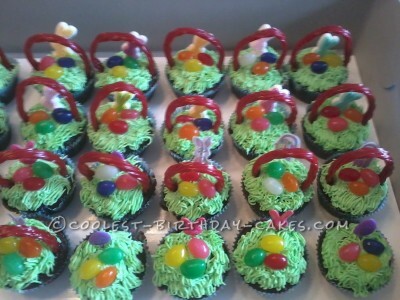 I then added a couple jellybeans to them and an edible Easter bunny candy for the appearance of an Easter basket. For the handle, I used Twizzlers. They were not hard to make and turned out cute! Enjoy! 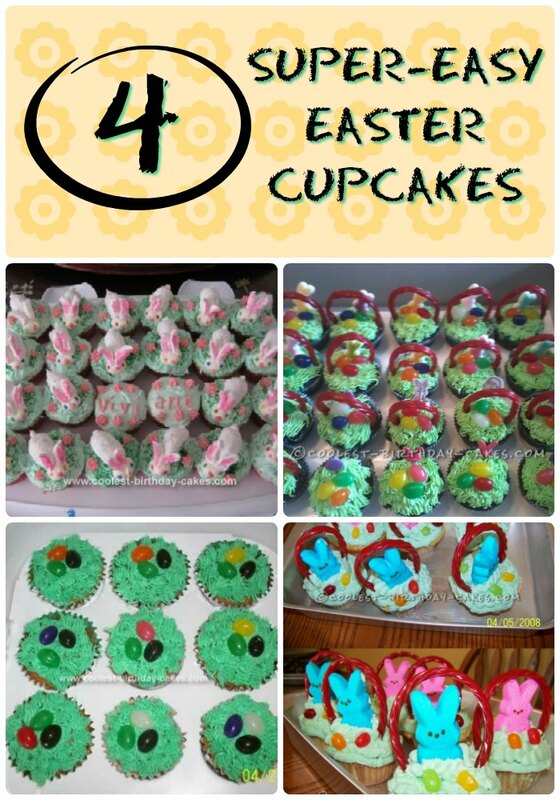 I made these Easter Cupcakes for my daughter’s Easter party at school. I used marble cupcakes. 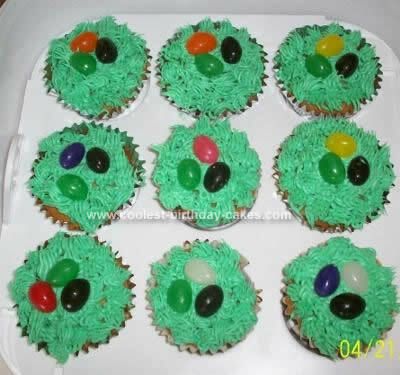 I colored my icing green and used a grass tip then placed 3 jelly beans on top to look like Easter eggs in the grass. These were a major hit with the class especially the teachers.